Pavarotti's greatest songs all in one place on this huge best-of - but where do you start with these incredible performances from Modena's most famous son? Take a look at our extensive guide to each of the 50 tracks on this amazing compilation. What other aria could kick off the ultimate Pavarotti collection? The one that made him famous, kept him famous and stands the test of time - soaring, simple and still up there as one of the most famous classical recordings of all time. A song, literally, about 'This Woman or That', taken from Verdi's Rigoletto. Pavarotti does well to give it such a carefree attitude in performance. One of his natural homes was on stage at the Royal Opera House, so it's no surprise that Pavarotti sounds so comfortable recording with their resident orchestra here. The great Richard Bonynge recorded with Pavarotti a number of times as his career went on, and the two were always able to produce fireworks - few so spectacular as this showpiece from Verdi's La Traviata. Donizetti's most famous aria (translating as 'A furtive tear') has had so many interpretations over the years that it'd be easy to forget what a sad little number it is. But in Pavarotti's hands, everything is emotional - just listen. As if we needed any proof about Pavarotti's range, here he effortlessly tackles Don José's big aria from Bizet's Carmen, full of Latin sass and eventually capitulating with a heartfelt "Carmen, I love you!" The Pearl Fishers' duet pits Pavarotti against Nicolai Ghiaurov - but rather than competing, they blend rather perfectly. A triumph of collaboration over showing off. Leoncavallo's Pagliacci is a full-blooded work to say the least, and who better to tackle that sort of thing than our Luciano? He is every inch the tragic clown here, smiling on the outside but subtly letting on his inner turmoil. If you can imagine Luciano Pavarotti in painting overalls, you're halfway there. This is one of the most famous arias in the tenor repertoire, and with good reason - Pavarotti gives something of a masterclass on how to deliver it here. The rather war-obsessed Radames, from Verdi's Aida, takes a romantic break from slaying rival nations here to praise the 'Heavenly Aida' herself. Mirella Freni is every bit as good as Pavarotti here, and it's a good thing too - this lovey duet (another from La Bohéme) requires two singers at the top of their acting game to make this a truly satisfying experience, with Karajan (pictured) at the helm. 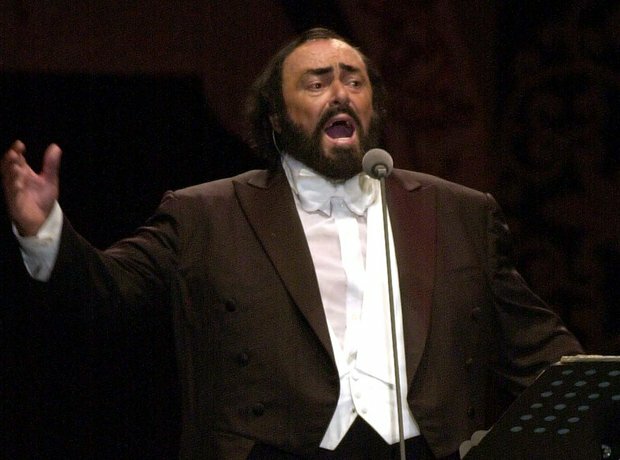 What a combination - one of the world's great opera conductors, totally at home with his orchestra, and taken to soaring heights by the voice of Luciano Pavarotti. Another breathless and emotional Puccini aria, this time taken from Manon Lescaut, the title translates as "I have never seen a woman". It's a good thing Pavarotti was a convincing actor. Puccini again, this time from La fanciulla del West. Pavarotti does devotional and romantic better than anyone - one look with those arched eyebrows is enough to send anyone into a swoon, but with lyrics like " Ah, you’re the only flower of my life!" it's even easier. The composer Umberto Giordano isn't one of the most famous writers of opera, but his opera Fedora is still remarkably popular even today - thanks in part to this magnificent aria , dashed off with aplomb again by Pavarotti. Giacomo Meyerbeer's last ever opera, The African Woman, features this glorious aria as a centrepiece. And taking on the role of a fictionalised Vasco da Gama? Well, who else could it be? Sung by Lionel in Friedrich von Flotow's opera Martha, this is a song of longing, taken from the first moment that our hero sees the object of his affection to the moment when she vanishes, taking his heart with her. That tune, so beloved and omnipresent, can only truly come alive in the hands of an expert. Well, you can see where this is going, can't you? Pavarotti scores another hit, with the greatest of ease. Collaborations don't get any starrier than this. The great Georg Solti is on hand here to steer Pavarotti's voice through the tenor solo from Verdi's Requiem, a moment of hope in work so usually synonymous with drama and stress. This duet from Verdi's La Traviata is one of the most famous drinking songs in the repertoire - so let Joan and Luciano pour you a glass of something stiff, and just enjoy the ride in the company of these two complete legends. As iconic performances go, this is probably up there with the very best of them. It marked a point in history when opera, for a moment, went completely global and spoke to everyone on the planet - and it was three tenors in particular who made it happen. The first disc of this epic Pavarotti collection ends in much the same way as it began, with another gorgeous slice of Puccini's La Bohéme. Disc two kicks off with a spectacular Neapolitan song, made famous by a particular brand of ice cream, but tackled properly by Luciano Pavarotti. The lighter side of Pavarotti's character was always ready and willing to come out, and he puts it to great use here with this tongue-twisting aria. Another Neapolitan classic, this time by the brotherly duo of Ernesto and Giambbattista de Curtis. It's been sung by the likes of Mario Lanza, Frank Sinatra and even Elvis, but few do it quite so emotionally as our Pav. Many will know this one from Pavarotti's Central Park concert in New York, but it actually holds an important place in history - it was the first song written for the Gramophone Company (otherwise known as HMV), back in 1904 by Ruggero Leoncavallo. It's a crooning classic, and who better to conduct it than the man who gave us the Pink Panther theme, Henry Mancini! It might seem an unusual pairing for Pavarotti, but just listen to how much fun they both have with it. Pavarotti and Henry Mancini team up again for another show-stopping performance. He might've been able to cut it on the opera stage, but few tenors could really take hold of the lighter material too, and that's why Pavarotti was such an enduring favourite. Pavarotti is so often associated with songs about romantic love, but this gorgeous number (with the ever-reliable Henry Mancini holding the baton) is all about celebrating mums. We bet mother's day was a belter round at the Pavarotti household. In this ode to the picturesque area of Naples, Pavarotti sounds as romantic and devoted as he ever does to his romantic foils. Translating as 'Don't Forget About Me', this is another heartbreaker with Henry Mancini (pictured) marshalling things from the front. Pavarotti's intensity is quite something here, as he implores his love not to let him go because "My life is tied to you, I love you more and more…"
This legendary Rossini song is a delight to hear anyway, but with the ever-reliable Richard Bonynge at the helm and Pavarotti's inimitable humour, it works even better. He was accustomed to performing it with only a piano accompaniment (search YouTube for a great version with James Levine at the keys), but Pavarotti sounds incomparable here with Bonynge's backing in this Bellini aria. Another Bellini number, this time translating as 'Only Make Her Happy'. Which, coincidentally, is what Pavarotti does to all of us. Paolo Tosti's hugely popular song is given the Pavarotti treatment. Though he was very much an exponent of the traditional Neapolitan song, Tosti actually became a British citizen in 1906. Does this one need much explanation? All the great singers have tried to match it, but Pavarotti's version beats most of them into a cocked hat. Pavarotti implores his love to 'Come, come away with me' at the end of this gorgeous song, and by the end of it you'll definitely want to go too. It's always been a popular number since Agustin Lara composed it in 1932, but Granada has well and truly become part of the light tenor's standard repertoire, and due in no small part to Pavarotti and his fellow tenors Placido Domingo and José Carreras recording it in the 90s. As his career went on, Pavarotti became ever more comfortable to perform alongside massive pop stars, recognising that he too was one in a way. So here we hear him duet with Sting, in every way a similarly individual voice in the music world (and a pretty mean lute player). More evidence that Pavarotti was more than just an opera singer - he could collaborate with maestros of the pop world too and make it work. Here he shares duties with the great Eric Clapton. You know how it is, you're just making a name for yourself by being an incredible opera singer and national treasure, then suddenly Stevie Wonder wants to get involved. Another example of Pavarotti's totally unique pulling power. Passengers was the name given to a collaborative project by U2 and Brian Eno back in 1995. But they were missing an opera singer to make this single truly come alive - and who better than Luciano to step in? They even performed the song together at one of Pavarotti's Modena concerts: here's Pavarotti with Bono. The perfect way to finish this epic collection off. Arguably the two biggest operatic and pop singers in the world collaborate on one of the most famous songs in history to truly epic effect. If you're not affected by it at least a tiny bit, by these two giants slugging it out in the vocal stakes, then you need to have your ears tested.